Aptly named, lovebirds are very intelligent and affectionate birds. They are a small, stocky type of parrot that tends to do best when kept in pairs. Not only are they a joy to keep, but they can also be quite entertaining because they are very curious and always into exploring. These birds are beginner-friendly, but they do require a bit more care than other species. Keep reading to learn more about lovebirds, including their nutritional needs. You’ll also see our top 5 picks for the best bird food for lovebirds. What Do You Need to Know About Lovebirds? How Much Should You Feed Your Lovebirds? How Many Times a Day Should You Feed Your Lovebirds? 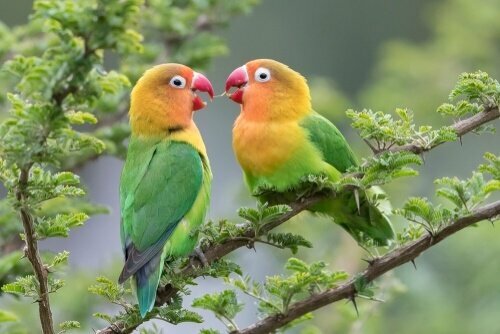 The lovebird is named for its loving, attentive bond that it forms with its mate. These birds are a small species of parrot, ranging from about 5 to 6 ½ inches in length. They have hooked bills like other parrots but short, blunt tail feathers – they are also stockier in build than other pet birds. Most lovebirds are native to Africa, and there are nine species in total, three of which are endangered. In captivity, these birds tend to live 10 to 12 years, though some have been known to live over 15 years. Quality nutrition is essential for a long, healthy life for lovebirds. These birds feed on seeds, berries, fruit, grains, and grasses in the wild, so variety is very important for a pet lovebird. In addition to a healthy diet, lovebirds also require a very large cage because they are an active bird. You should plan to provide four perches for each pair as well as plenty of space for food and water dishes as well as a space for bathing. Lovebirds love to drink and bathe, so make sure to provide lots of fresh water. Wild lovebirds forage for a wide variety of foods including seeds, grains, grasses, fruits, berries, and leaf buds. In captivity, most birds do well with 1 ½ to 2 ounces of high-quality seed, supplemented with fresh vegetables, fruit, and millet spray. You can also offer small amounts of protein in the form of unshelled peanuts and other nuts. Complete and balanced – Commercial pellets provide complete and balanced nutrition in every bite, but some birds simply don’t like them in comparison to seeds. Variety of seeds – Most birds love to eat seeds, and some develop a preference for a certain type, but it is important to include a variety of the sake of balanced nutrition. Grains, fruits, and veggies – Grains help to provide variety in a lovebird’s diet, so look for grains to be included along with seeds and dried fruits and veggies. No artificial additives – In addition to checking that your lovebird food contains certain ingredients, there are also things you do NOT want to see like artificial colors, flavors, and preservatives. Keep reading to see our top 5 recommendations for the best bird food for lovebirds. It is your choice whether you feed your lovebirds a commercial pellet or a blend of seeds, but make sure to choose a high-quality product either way. If you plan to feed a seed blend, keep an eye out for your lovebirds picking out only their favorite seeds – you may need to supplement with fruits and veggies to make sure your lovebirds get the nutrients they need. 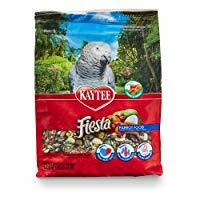 Many lovebirds prefer seed blends to pellets and this Kaytee FortiDiet Pro-Health Conure and Lovebird Food is a great option. Not only does it provide a wide variety of seeds, grains, and dried fruits and veggies, but it is enriched with vitamins and minerals to ensure complete and balanced nutrition. This recipe is also enriched with omega-3 fatty acids which, in addition to supporting brain and heart health, also keep your bird’s feathers healthy. This formula contains no artificial preservatives but it does contain added prebiotics and probiotics for digestive support. 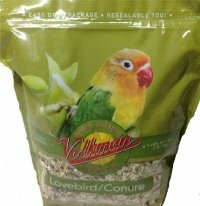 For lovebirds that prefer seed blends, this Volkman Seed Company Avian Science Lovebird & Conure Bird Seed is an excellent choice. Available in a 4-pound and 8-pound bag, this blend of seeds is specifically designed for lovebirds and conures. It is a wholesome daily diet that contains both healthy and delicious ingredients like safflower seed, millet, canary grass seed, and dried fruits and veggies. It provides complete and balanced nutrition but also contains exotic ingredients that will appeal to picky eaters. 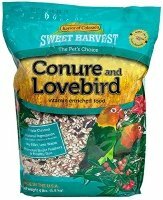 Another excellent choice in seed blends for lovebirds is this Sweet Harvest Conure and Lovebird Bird Food. This formula contains a high-quality blend of natural ingredients with less filler and waste than other brands. The seeds themselves are triple-cleaned to reduce dust and maximize nutrition. You’ll also be glad to know that this formula is enriched with essential vitamins, minerals, amino acids, and omega-3s to ensure vibrant feathers, healthy skin, and longevity. Overall, it is nutritionally complete and balanced for lovebirds, though some birds tend to pick out only the seeds they like best. If you’re looking for a complete and balanced diet formulated specifically for lovebirds, try this TropiMix Premium Food Formula for Cockatiels and Lovebirds. Not only is this formula nutritionally complete and balanced, but it provides enrichment for your bird as well. This recipe builds the immune system by stimulating circulation and it provides essential vitamins and amino acids for healthy plumage. This formula has a great taste that appeals to lovebirds and comes in a zippered bag to ensure freshness. 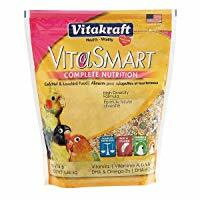 Complete and balanced nutrition is essential for any bird and this VitaKraft Vitasmart Cockatiel & Lovebird Food is a great formula specifically designed for lovebirds. Not only does it contain a wide variety of ingredients, but it is balanced in terms of nutrition. This recipe supports your lovebird’s complete health and wellness while also appealing to his preferences for flavor. Plus, it is enriched with omega-3s for bright plumage and DHA for healthy heart and brain function. On average, lovebirds consume between 1 ½ and 2 ounces of feed per day. The amount your lovebird eats may vary depending on its activity level, so if you provide a large enough cage for the birds to exercise they may require more food for energy. Most birds tend to eat small amounts throughout the day, so plan to provide a day’s worth of food for your lovebirds once a day. It is important to thoroughly clean the feed dish before you refill it and to always provide plenty of fresh water. Lovebirds drink a lot of water, so you may also need to check the dish throughout the day to see if it needs to be refilled. Complete and balanced nutrition is the key to long-term health and wellness for your lovebirds, so purchase the highest quality bird food you can consistently afford. Commercial pellets provide complete and balanced nutrition in every bite, but many birds prefer seed. If you’re not sure where to start shopping for lovebird food, try one of our top 5 picks reviewed above!